It has been a while since I’ve posted anything so it’s time to bring a little bit more life to the blog. After my self-inflicted solitary confinement due to exams, I immediately focused on restoring what was left of my social life. Luckily my friends understood the reason for my absence. I had a week to catch up with everybody in rainy Holland and then I was off to sunny Barcelona. I just spent my first week here, a little less than two to go. My aim is to be able to speak Spanish (elementary) after these weeks, I want to at least feel comfortable when I speak the language. I don’t need to become an expert, not sure if that’s even possible in this short period of time. Well It might be, but I’m not planning another solitary confinement and definitely not while staying in Barcelona. I think this is my first time being completely alone on a trip for so many days. I had to get used to waking up in the morning and just following my own plan without discussing it with friends and combining ideas. Not implying that one is better than the other by the way, both have their pro’s and con’s. With friends you can get new ideas and maybe be more adventurous than when you’re alone for example. I chose to go alone because I wanted to experience this kind of travelling. I also wanted to clear my mind and refresh, so being alone might help this process. Doesn’t mean I don’t talk to people, I bother strangers from time to time. To practice my Spanish or just for a simple chit chat. 🙂 Everybody I speak with is very friendly and I’m enjoying every second of my stay here. My name appears to be difficult to say in Spanish, which I didn’t expect. The girl whose apartment I’m renting is very friendly. I’m very happy with that, so I had to share it with you guys. If you are visiting a city and have time, explore the neighborhood you’re staying at first, just to see some other things and then go on the usual sightseeing trips (which are also beautiful of course). I really enjoyed the walk in ”my” barrio. Siësta in the sun is great if you’re planning on looking like a tomato on one side of your body. Once you get near the city center don’t use the metro for short stops, use your legs. From Plaça de Catalunya a lot of the places worth seeing are nearby and easy to walk to. If you want to eat outside and cheap, just ask the locals where they eat. Avoid the usual places where you might go when you’re in your own country and follow their advice. That’s what I’m doing and it’s working well for me and my bank account. 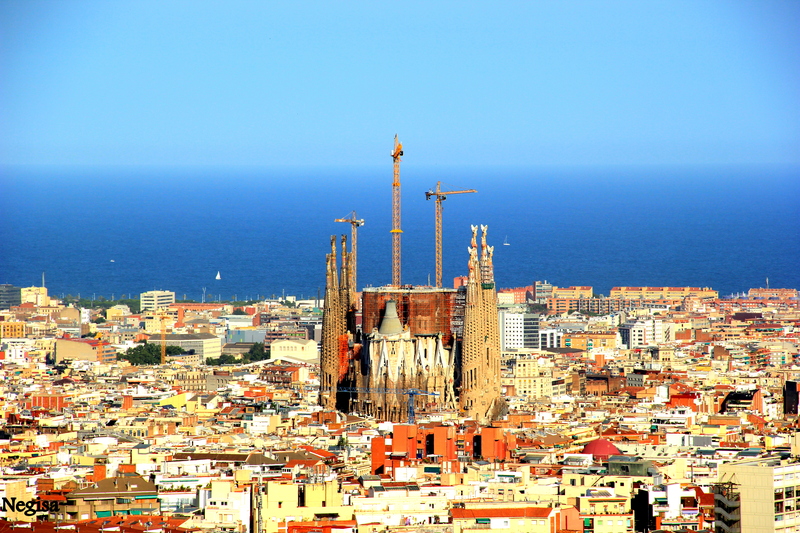 For a great view of Barcelona visit Tibidabo and Montjuïc. There are a lot of things worth seeing around and on Montjuïc as well. Here’s a list. I can write a lot more but let’s stop here because I can go on forever. Maybe I’ll make another post like this again, to share some stuff. *I’ve taken both pictures when I was at Parc Güell. Great place and also a nice view of the city. Super leuk om je ervaringen te lezen! Zou willen dat ik zo stoer ben als jij en dit soort dingen in m’n eentje te doen. Ben heel benieuwd hoe het de komende weken wordt en hoop dat je nog n x de tijd vindt om een post te schrijven. I am proud of you, Love! Dank jullie wel lieve vriendinnen! !